We are committed to serving the community and continue to collaborate with other organizations to help those in need. 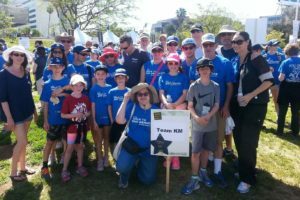 The KM Social Action Committee plans opportunities for all members to attend events and fundraisers to support and raise money for various projects throughout the community. The Social Action Committee is always looking for projects to support. Let us know if you see a need anywhere in our community. KM is a proud supporter of Jewish World Watch (JWW), a project of a coalition of synagogues working together to mobilize synagogues, their schools, members and the community to combat genocide and other egregious violations of human rights around the world. “Sova” is a Hebrew word meaning “to eat and be satisfied.” The SOVA Food Pantry is a non-profit, non-sectarian program of Jewish Family Service of Los Angeles (JFS). Every week, volunteers distribute food to those in need at the three SOVA Food Pantries and Resource Centers. SOVA needs your help! Financial donations are appreciated, as are non-perishable, unopened packages of food. SOVA also welcomes donations of can openers, toiletries (shampoo, soap, toothpaste, toothbrushes, etc. ), and baby food and supplies (such as diapers, wipes, and formula). You may leave your items in the large round SOVA bin in the KM synagogue lobby, or deliver them directly to the SOVA pantry in our area. The Jewish Federation’s Tour de Summer Camps, presented by The Rosalinde and Arthur Gilbert Foundation, is a community cycling event that raises significant funds to help us ensure the Jewish future. All proceeds will support camp scholarships, to help our Federation give even more kids that magical connection to Judaism that only Jewish summer camps can provide.